I got interested in the hyperlocal Maplewood BlogolopolisTM because the mighty New York Times was wading into the fray (and I happen to know the local Times reporter). But it turns out the Times is only the SECOND-best capitalized hyperlocal effort in Maplewood. The newcomer to watch is something called Patch.com. 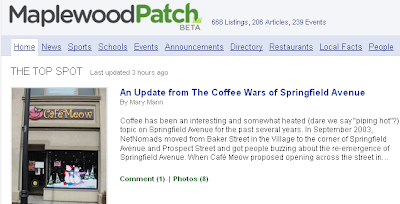 I barely noticed Maplewood Patch when it launched in … well, whenever it was. Recently. Their logo clearly says “Beta”, and besides I’m not nearly as well tuned in to the local scene as a lot of my Maplewood neighbors are, so I just wasn’t that interested. I visit the (extremely active) Maplewood Online (MOL) bulletin boards sometimes if I’m looking for a referral for a handyman or whatever, but I never got into the social gestalt of those boards, and I don’t follow local politics. Every time I peeked in, however, I was impressed by how vibrant the community was. And MOL honcho Jamie Ross has always been good about publicizing our events at St. George’s Episcopal Church, where the Web Goddess and I are both very active. Yesterday I wrote mainly about the launch of the NY Times “The Local” site for Maplewood and environs. I noted that Patch.com and the NYT both chose the same three towns for their respective pilots — Maplewood, Millburn and South Orange — and I said something snarky about it being hard to reach somebody who could speak on behalf of Patch. Today I got a call from Brian Farnham, Editor-in-Chief of … well, I guess of Patch.com, although their About Us page is fuzzy on the name of the entity, referring to “the people behind Patch.” Brian confirmed what I was starting to realize yesterday — that although it looks on the surface as if the New York Times and Patch.com have exactly the same business model for Maplewood, they are in fact closer to being exact opposites. Brian, who had read my snarky comment, was very gracious and started by apologizing for not getting back to me more promptly. I parried that with an apology for not reaching out sooner. Brian wouldn’t let himself be pinned down about a timeframe for expansion, and he wouldn’t give me an estimate for the company’s monthly “burn rate” (a dot-com-bubble term that seems so last-century now). But the company is backed by a Google zillionaire, and they’re making a serious upfront investment. About half those 20 people are fairly junior, but at the VP and Director level, everybody has serious online and/or media credentials. 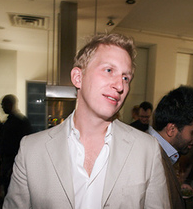 Brian, for example, is a former Editor-in-Chief of Time Out New York, and his fellow poobahs include seasoned Harvard MBAs and executives from non-trivial media ventures (Gannett, CBS, etc.) None of the senior people are working for just stock options and food. The New York Times, OTOH, is taking its first tentative steps into the hyperlocal “space.” They’ve assigned one full-time reporter each in New Jersey and Brooklyn — and the paper says even that level of commitment is economically unsustainable in the long run. Maplewood resident Tina Kelley and her Brooklyn colleague at the Times were interviewed today on WNYC Radio, and they both freely acknowledged that the business model may look very different down the road. This rings true to me. Think about Patch’s business model — if they don’t start expanding soon and build a broad base for advertising, even the most patient angel investor will get antsy. Salaries alone have to be costing them six figures every month, and their current revenue from the three initial Patches is either zero or something that rounds to zero. While the current faceoff looks like Googliath vs. Jamie Ross, by the end of 2009 I expect Maplewood Patch will be just one of dozens or even hundreds of local Patches. Patch.com’s business model will either work or it won’t — and if it works, Maplewood will be a tiny part of its traffic. The financially cratering New York Times will either find a business model that works or it will sell the extremely valuable brand to someone else — and either way, the Times‘s Maplewood blog will be a footnote (sorry, Tina, but I suspect you agree). In any event, I don’t think MOL needs to worry. 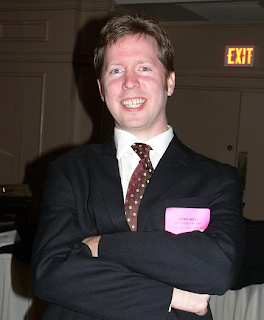 In fact, once the economy improves, I could envision a very nice payday for Jamie Ross, if he has any interest in having a partner with deep pockets. One suggestion for how the newspaper industry can save itself has been for it to go hyperlocal, focusing on individual communities with the sort of local news usually provided by weekly Pennysaver type publications. Patch Media, a heavily VC (and Google) funded company, has jumped squarely into this space and, as of today, so has the New York Times. Both efforts are happening right in my hometown. The only problem is, The Times is not doing a very good job of it. To coin a phrase, read the whole thing. (Disclaimer: I didn’t actually coin that.) Tina Kelley has responded in Alan’s comments.